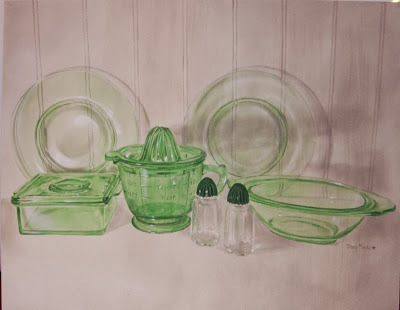 I have been busy working on another custom still-life painting. 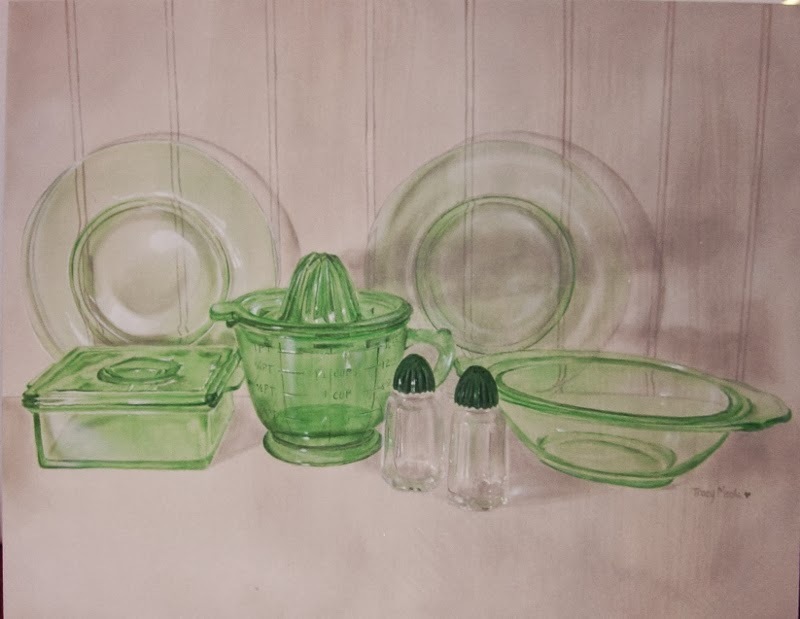 This painting is for a collector of Green Depression Glass. I went to her home and took some photos of the glass and then had to work from one of the photos that I had taken. The smaller image below is the photo I had taken, and the one below that is the final painting. The painting's colors got a little washed out when I took the photo of it, I was using a smaller auto camera and the flash washed some of the vibrancy out. You can't really see those really high, highlights that I like. I wanted to get it right up on the blog so I couldn't wait for my photographer to take the photo. ( :) Vic) I will post a new one when it is photographed properly. This painting didn't come out quite as "realistic" as usual. It is the nature of the beast (me, that is). My paintings can reflect how the paint is flowing with my mood. Plus this one took me longer than usual to finish. I'm going to take a little break from the intense painting and do some more crafty things. I need a chalkboard display for an upcoming show that I will be doing with my cards. So I'm going to work on that, plus I think I will play around with some glass paint. Then it will be back to some orders......they are piling up so I have to keep moving. Don't worry....I will share my crafty findings with you too!